Highly rated American international Timothy Weah has left Paris St Germain for a stint with Scottish giants Celtic. The attacking midfielder, who is comfortable also playing as a striker, has been coveted by many of Europe's top sides but has elected to move to the United Kingdom to continue his development. A difficult start to the season for Celtic has left the club off the pace in the Scottish Premier League and manager Brendan Rodgers hopes the arrival of Weah will boost the club's chances of retaining their league title. 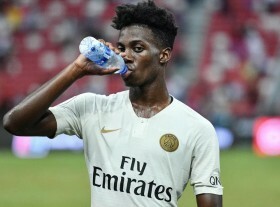 Brendan Rodgers told reporters of the impending move for Weah: “Timothy’s a young talent who is full international player. He has a long career ahead of him but he has those natural attributes in terms of his pace and technique." It is understood that PSG want the player to return next season as an important member of the club's first-team squad and that he will eventually challenge the likes of Neymar and Angel Di Maria for a spot in the Paris first-team. Weah has a four year contract with the Ligue 1 Champions.